This intuitive prejudice against inflation may not be purely rational, but in normal times it’s beneficial: it encourages sober habits and discourages quick fixes. But, in times of crisis, other policies may succeed where pure rectitude can’t. … the economy doesn’t exist, in the end, to reward virtue and punish vice. It exists to maximize our well-being, and, currently, doing that may require helping the undeserving and irresponsible, if only because there are so many of them. Boosting inflation isn’t the right policy, but it may just be the correct one. Inflation is actually a form of the hermeneutical circle: the way we think the future will pan out changes our current economic behavior. If we think prices won't rise, or even fall, then why should we consume or invest now, since if the real value of our savings is bound to grow, postponing economic activity and hoarding cash makes a lot of sense. However, if everybody does that, we will get a stagnating economy that might easily end up in a crisis. That, and not crisis investment, is the main Keynesian argument for government spending and deficits. Also, the other way around, if we think that prices will be very volatile in the future, again why should we consume or invest now? However, if we assume that there will be a moderate growth in prices, it makes a lot of sense to consume or invest now, as this way, we can profit from current lower prices and by investing actually reap future higher prices. In that sense, moderate inflation is a function of moderate growth as well. That's why Keynes thought that government should essentially always run deficits, as this way, there's always slightly more money around than really needed and thus there's moderate inflation that then feedbacks into economic behavior. And of course, in situations with high debt levels, moderate inflation is doubly interesting or good as it favors current investment over past debts and current savings. A 2001 study that looked at the “macroeconomics of happiness” found that higher inflation put a severe dent in how happy people reported themselves to be. The distaste for inflation is such that a 1996 study (titled, aptly, “Why Do People Dislike Inflation?”), by the Yale economist Robert Shiller, found that, in countries around the world, sizable majorities said that they would prefer low inflation and high unemployment to high inflation and low unemployment, even if that meant that millions of extra people would go without work. So, naturally, the challenge to good economists and policy-makers is, according to Surowiecki, to explain to the people why moderate inflation is actually in their own interest. Or is i t? That depends on what economics is for. 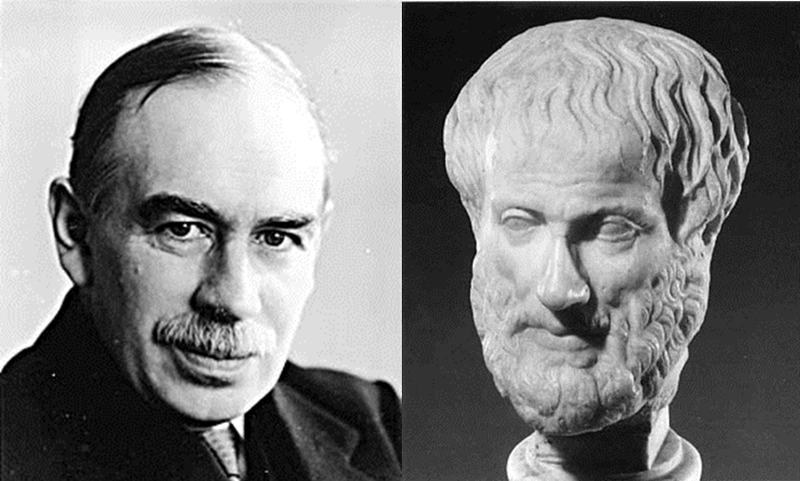 Keynes, in a speech towards the end of his life, declared that economists are the "trustees, not of civilization, but of the possibility of civilization." The entire idea of democracy is to prevent experts, who do not only think they know best, but who actually do know best, from making the final decisions, because the rule of the expert does not exactly have a good track record in human history. (And the reasons for that are, among other things, that we cannot agree on what is best; that if we could, we couldn’t communicate it; that human happiness is a moving target; and so on and so on.) Our civilization, from the polis to today’s democracy, from public sphere to public policy, is based on the assumption of autonomous individuals who can make up their own minds and who have a meaningful idea of what is good for them. They make the basic choices, and those basic choices actually form what the polis, the comune, the state in the end is about (Leo Strauss’ point) – because choices could be otherwise as well, but they are the way they are, yet they can and do develop. The Good Life in the Good State, Aristotle’s goal of living together in a structured manner in place and time, is objectively ascertainable, but it rests on the combination of subjective decisions regarding what the Good Life actually is. Economics, again, is to enable this; it’s not a substitute for the Good Life – it’s a means, not an end. If that is so, if a majority of people, everywhere on the globe, say that they'd rather not have inflation, because for them, monetary stability is more important, for a variety of reasons (choosing not to reward the unworthy; choosing as much stability and predictability as possible as high priorities in life), and if they know what the negative effects may be or even will be (and of course, in economics this is never fully clear), then if one basically believes in those autonomous individuals – and the form of human consociation based on this, which is Democracy –, this is a very strong argument in favor of currency stability and against inflation. In other words, my point is that the popular anti-inflation stand, according to Shiller’s indeed still extremely interesting research, may not be just good or bad economics but rather, like institutions such as private property or monogamous marriage, a way-of-life choice within the polis, and thus beyond the say of the expert. Of course, these things can change. Of course, things have been different – memories of William Jennings Bryan and the "Cross of Gold" come up. Of course, happiness research has always suggested, and now has come to the agenda again (such as Derek Bok in a recent book) that people do not know what makes them really happy. Of course, in a moderately rational world, people should pay attention to rational arguments. Of course, if one feels strongly that inflation increases human happiness, one should do what one can to make people see this. And thus, the discourse can and must be kept open. But still, fear of inflation, if, as I suggest, it at least often is really based on choice and priority setting, however subconsciously, is not irrational then, because basic world-view-based goals are beyond the rational/irrational divide – that divide is about questions of how to achieve those goals. That may be very regrettable indeed from an economic policy perspective, but many of our choices are like that. In the end, what matters isn’t the correct policy, but rather the right one, and the system in which we have chosen to live, Democracy, has been set up precisely to make the chances higher that sometimes, the right things are actually done – or at least that the wrong ones are avoided as often as possible.